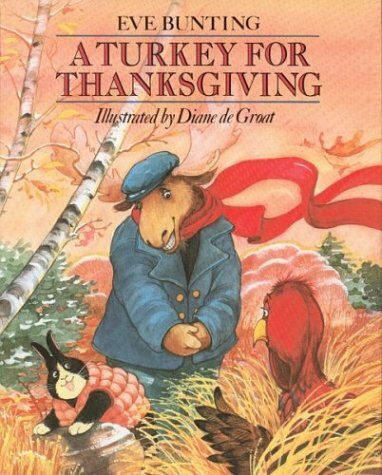 Eve Buntings, “A Turkey for Thanksgiving” is my all-time favorite Turkey Day tale. In it, Mr. and Mrs. Moose are hosting Thanksgiving for all of their woodland friends. Mrs Moose sends Mr Moose out on an errand to get a real turkey for the event. Mr Moose is soon joined by Rabbit, Porcupine and Goat – all ready to get the turkey for their feast. As you would imagine, poor Turkey is terrified – picturing himself roasted and stuffed to the gizzards. But what really happens, is as touching and heartwarming as any moment I can recall. A great read-aloud book for your younger guests that will make you hungry for more.